In today's highly charged and competitive real estate market, agents have to do more than acquire a license. They need to use all the skills and tools at their disposal. Increasingly, online tactics are becoming more and more the rule, rather than the exception to effective marketing. Increasingly, it's becoming more than having a website, an effective Facebook business page, and a mediocre real estate blog (you can't just rely on your company's real estate site). You need laser-sharp strategies for finding fresh leads and great sales opportunities. Now is the time to market yourself online and reap the benefits of real estate internet marketing. 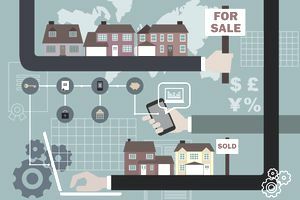 Here are some of the best practices when it comes to successfully marketing your real estate business on the internet. As more people view online content with mobile devices like smartphones, you must ensure that your web pages stand out on the smaller screen. It may even be safe to say that right now more than 50% of your website visitors to your real estate site are coming from a mobile device or tablet. Prospective houses are inherently visual and must be seen in their best light to attract prospects. Therefore, your own design must be fluid, i.e. your images and text must seamlessly transfer from traditional desktops to smaller machines. Responsive device design will translate into more views, leads, and sales because people will appreciate your website's accessibility from multiple devices. For example, attractive cover art can add sizzle to both your social media profile and your mobile pages. You'll also want to ensure that you are optimizing your email for mobile marketing and adhering to mobile email marketing best practices. How does your website look on a mobile device? If it's not good, hard to read, and not optimized then you are surely losing leads, listings, and sales. These days, using the power of online real estate services can help you target specific markets. Both buyers (especially tech-savvy, first-time buyers) and sellers like to research prospective homes at their leisure and will devote as many hours to their search as required. Meet them where they spend the most time. Generally, the more relevant information you can provide the better. You may not convert a visitor into a house buyer overnight, but if you capture their contact information, you will have a chance to make an impression as a real estate expert over several weeks or months (or even years). E-mail real estate marketing can become an effective tool for open house invitations, monthly market updates, and offering useful tips to people in transition. People may not be ready to buy or sell right now, but when they are you'll have top of mind awareness and be their go-to agent because you've kept in regular touch with useful information and have established yourself as the authority in your market. Not only that but maintaining top of mind awareness can also lead to more referrals from the people you keep up to date with your real estate email newsletter. When you successfully complete housing transactions, it's important to use the positive relationships you developed to build up your reputation. In addition to keeping a profile on the best home listing networks, invite your clients to submit a review of your work. Websites like Zillow.com and Homes.com get millions of views every month, and much of this traffic is targeted for housing professionals like you. Turn the best reviews into testimonials for your website. Claiming your business on Google and getting reviews there can help you get higher search engine rankings as well as make you stand out as the go-to person in your local market. You'll want to be sure to address any negative reviews with online reputation management best practices and have a system to monitor and respond to comments on social media. Houses are meant to be showcased from both the inside and the outside, so use the front-end of your real estate funnel to show them in their best light. Adding a link is useful because people can access specific details of your listed homes, or a mobile app, or an upcoming event. Cover photos highlighting one of your best properties can be especially effective on sites like Twitter, Google+, and LinkedIn. Be sure to use images that are optimized for the web so that your site loads fast. See Also: the best time to post on Twitter, Facebook, and LinkedIn. Forums remain popular and effective meeting points for buyers, sellers, and real estate agents. Answering a few questions well can enhance your reputation and encourage people to visit your social media profiles elsewhere. Eventually, they may even want to meet with you personally. Discipline yourself to use thirty (30) minutes daily (at most) to answer good questions and engage with potential clients. Another great opportunity is to join local Facebook Groups in your community and be a useful resource as well. You'd be surprised how many buyer and seller leads you can generate free from social media. If you’re not using video as part of your online marketing strategy yet, you should be. According to Mashable, a massive 73% of homeowners prefer to hire a listing agent who uses online video. According to Aaron Miller from AgentHacks.com, “The two keys are first to overcome the fear and don’t be afraid to put yourself out there. Second, don’t be intimidated by the technological challenges of online video.” Miller continues…”There are many elaborate high-end videos out there but those are typically done by pricey agencies. If you’re looking for ideas on what to record you can always get started with an agent bio video, videos of your property listings, as well as doing virtual open houses on Facebook Live. Be sure that your website is optimized for speed. Especially when it comes to real estate, which will include multiple high-quality images which take more time to load, it's important to ensure that your site loads fast. A faster website will increase the likelyhood of poeple staying on your website and also help your site rank higher in the search engines which, all things equal, will lead to more visitors, leads, listings, and ultimately sales. Real estate success does not demand that you become a computer expert per se. However, using the online tools at your disposal can give you the edge versus both local and national competition. Following the above advice will raise your profile and attract a more serious, affluent clientele.